New research by Peter Ralph of USC Dornsife has confirmed that everyone on Earth is related to everyone else on the planet. So the Trojan Family is not just a metaphor. Turns out, we're also linked by genetics more closely than previously thought. The assistant professor of computational biology's background in math and statistics enables him to develop methods and models and perform data analysis on genomic data, which he applies to learn about evolution and demography. His latest research, which he conducted with Graham Coop, a geneticist at University of California, Davis—his former postdoctoral advisor—provided DNA-based evidence to confirm the mathematical theory that everyone on Earth is related. "The fact that everyone has two parents means that the number of ancestors for each individual doubles every generation," Ralph said. "By using basic mathematics, we can calculate that ten generations ago each individual had a thousand ancestors, and 20 generations ago they had a million and so on. "But when we get to 40 generations ago, in the time of Charlemagne, we arrive at a trillion ancestors and that is a problem because we now have more ancestors than there were people. Thus one can deduce that a lot of those ancestors must be the same person." To visualize this concept, Ralph suggests drawing an imaginary family tree. "At first it does look like a tree, with the branches doubling every generation, but then pretty soon the branches start running into one another and it begins to resemble more of a web-like tapestry as distant cousins marry and share a set of distant grandparents," he said. "That means that although hardly anyone marries their cousin in Western Europe, many people are unwittingly marrying their 30th cousin." A paper published in 1999 by Joseph Chang, a statistician at Yale University, analyzed this tapestry mathematically and concluded that we all share a common ancestor. Indeed as we move back in time, the number of common ancestors of the living population increases until the point where "all individuals who have any descendants among the present-day individuals are actually ancestors of all present-day individuals." Since the publication of Chang's paper, huge advances in the collection of genetic information have allowed scientists to compile vast DNA databases. 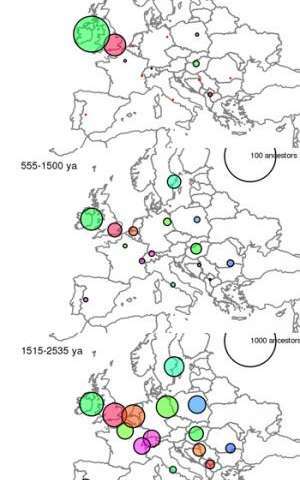 Ralph and Coop focused on the ancestry of Europe by using the Population Reference Data Sample which provides whole genome sequencing data on 2,257 people living in more than 40 European populations. They chose this sample because it provided a particularly good match of geography to a genetic data set. The DNA sequences it provided also covered 500,000 locations on the genome known to indicate individual variations from person to person. Using a computer program, the researchers were able to find identical, or nearly identical, DNA sequences and use these matches to work out who was related to whom. Ralph and Coop identified 1.9 million shared segments of DNA that were millions of base pairs long, proving their owners were related. They were then able to estimate how long ago their common ancestor lived from the length of the segment. "The length of a shared DNA sequence shows how closely, or distantly, two people are related," Ralph said. "Thus DNA sequences shared with parents are the longest, those shared with grandparents are half as long and those shared with great-grandparents half as long again and so on. "So the longer ago an ancestor is, the shorter the chunk is likely to be." "Our research confirmed what Chang suspected—that everybody who was alive in Europe a thousand years ago and who had children, is an ancestor of everyone alive today who has some European ancestry," Ralph said. Ralph and Coop calculated that these shared segments showed ancestors stretching back some 3,000 years, or 100 generations. This lends support to Chang's calculation that by expanding his model from living Europeans to everyone alive on Earth, an all-ancestor generation would have occurred some 3,400 years ago. "On top of that it was surprising the extent to which you could also see the effects of history in the patterns we found," Ralph said. While their research showed that Europeans living closer to one another were also more closely related, it revealed that people in Eastern Europe tended to have more shared ancestors than Western Europeans. "We could really see the demographic effects of the Slavic expansion in Eastern Europe around the time of the fall of the Roman Empire," Ralph said. "In a population expansion, people are having more children than in a stable population. So, if that larger, expanded generation traces their family back through time there is an increased opportunity that they will have shared ancestors because the pool of potential ancestors is smaller." Ralph's research has the potential to help solve long-standing questions in various areas, including history, archaeology, linguistics and ecology. For example, his findings may help settle the debate over the Germanic Tribes who sacked Rome and whose movements have been dubbed "Barbarian Invasions." Differing historical viewpoints maintain either that the Germanic Tribes took over and displaced the population, or alternatively that the "invasion" consisted more of small groups moving in and establishing themselves as leaders. "Clearly these two views have very different demographic implications," Ralph said. "The integration of a small number of people is very different to the driving out and replacement of an existing population." By analyzing the number of common ancestors in a particular area, Ralph might be able to determine migration patterns, including the numbers of people involved. "While we did see the effect of the Slavic expansion, we didn't see a similar effect on the areas that the German Tribes moved into, suggesting their movements were those of small groups involving less large scale displacement." "Our research lends itself to cross departmental collaboration," Ralph said. "It would very interesting to work with historians or archaeologists on projects such as finding out whether people living in places connected by Roman roads have greater numbers of shared ancestors." By working out migration patterns through shared ancestry, Ralph's research can also add another dimension to the linguist's study of the history of languages. This lends support to Chang's calculation that by expanding his model from living Europeans to everyone alive on Earth, an all-ancestor generation would have occurred some 3,400 years ago. What about the separation of New World and Old World? "Thus DNA sequences shared with parents are the longest, those shared with grandparents are half as long and those shared with great-grandparents half as long again and so on. Until you run again into the problem of the first few paragraphs where distantly related people intermingle/share grandparents. Then the halving (or even the shortenning) should stop altogether. Bit queaesy about that number, as it doesn't take into acount hard geographical boundaries that can keep populations apart for quite some time. It's interesting research - but I feel it should be taken with a grain of salt. this does not say that the N. American indian tribes are ancestors of Native Australian tribes. It says if you were alive 3400 years ago and had children -- then you and everyone else in your generation are the ancestors of everyone alive today. If it was a math function it would be surjective or onto. If you are alive today -- then you have an ancestor that was alive 3400 years ago that had children. If you were alive 3400 years ago and had children you are an ancestor of someone today. If you were alive 3400 years ago and had children - you are part of a generation that is the common ancestors of everyone alive today... even though your lines may have died out, others in your generation survived. We know that family lines can die out completely after several generations, so this statement is obviously not true. However, I remember reading about a study a couple of years ago that shows that if a family line produces offspring for at least six generations, the descendants will be so numerous and widely spread that the line almost certainly will continue to produce offspring. Thus, any individual who has had descendants for at least six generations, will probably have descendants today regardless of when s/he lived.